Lily Dawson, dubbed the Countess of Charm by the Prince Regent himself, plays the role of the courtesan flawlessly while her real purpose is spying in the service of the Crown. Her mission now is to seduce a duke to test his true loyalties. She'll do it, even though the man she really wants is Andrew Booth-Payne, Earl of Darlington—the duke's son. 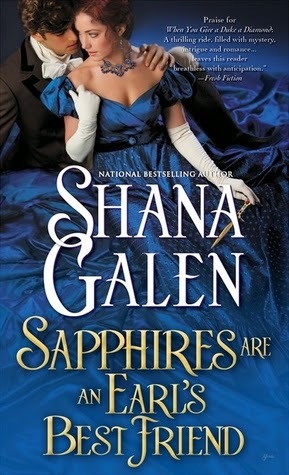 Sapphires are an Earl’s Best Friend is the third in the Jewels of the Ton series. I haven’t read the first two books, but did see a couple of really good reviews for them. So I was excited to start this book. Unfortunately it didn’t exactly match my expectations. Right from the beginning I was a little lost about events that had happened in the other two books. Lily and Andrew had a back story that I knew nothing about and was hoping that as I kept reading Shana Galen would fill in the blanks, but unfortunately they didn’t get answered. The plot of this book is the typical romance novel format. Boy and girl don’t like each other, but are attracted to one another; boy and girl have a fight and end up in bed and love each other happily ever after. I really don’t mind those kinds of romances, unless the main story is a bit forced. Which this one is. Lily is supposed to be a spy and good at her job, but at all turns she is. She is constantly “rescued” by Andrew; and really isn’t a well-developed character that you can relate too. Andrew is a typical male who wants to be right at every turn; and must rescue someone in the process. I really wanted to like Lily and Andrew together. I thought they would be strong and fun to be around, but they didn’t seem to click. They went on a few adventures but after this story I don’t think they would live “happily ever after”. Even the villains in this story didn’t seem to have any punch. They just sort of showed up to give Lily and Andrew something to do. Shana Galen is a good writer, and this book was good to read. Unfortunately I think this was a little forced and not up to her usual standard. If you have nothing else to read and have read the other two books in this series, pick it up. It wasn’t a bad read, just not an exciting one. Shana Galen is the bestselling author of fast-paced adventurous Regency historicals, including the RT Reviewers' Choice The Making of a Gentleman. Her books are published all over the world and have been featured in the Rhapsody and Doubleday Book Clubs. She taught English at the middle and high school level off and on for eleven years. Most of those years were spent working in Houston's inner city. Now she writes full time. She's happily married and has a daughter who is most definitely a romance heroine in the making. Shana loves to hear from readers: visit her website at www.shanagalen.com or see what she's up to daily on Facebook and Twitter.